I recently had a ten days stint to visit friends and do some skiing on New Zealand’s South Island. Most of the hanging out and relaxing took place in my favorite part of this charmed country, the beautiful North Otago (also known as the Waitaki region). Last time I was here was a good 2 1/2 years ago, but to re-acquaint myself with the place I took my trusty forester and drove around all those familiar back roads around the hamlets of Enfield. Ngapara, Tokarahi, Five Forks and Weston. 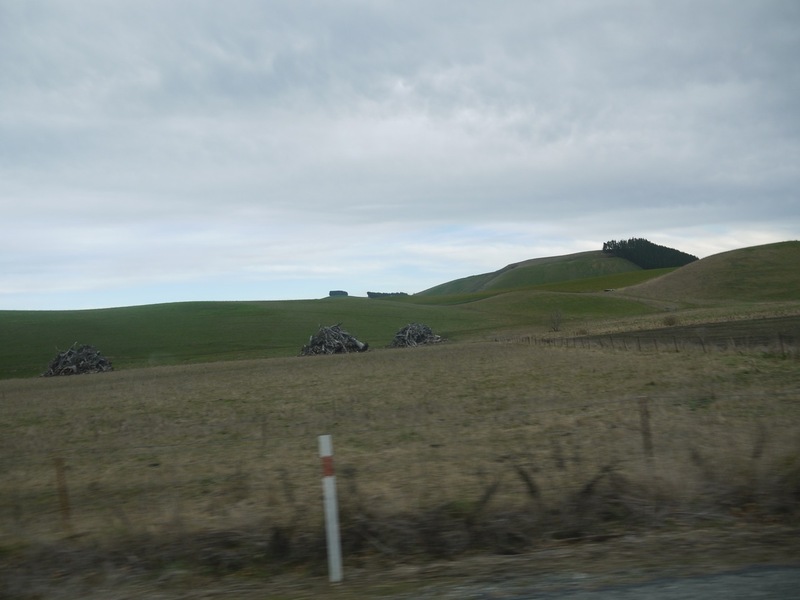 These used to be gently rolling hills, interrupted by native or old planted European trees, hedges and interspersed with rocky outcrops from the famous Oamaru Whitestone. While shaped by man for farming, the area nevertheless retained an oldwordly charm and invited walking, cycling and gentle excursions with my beloved Morris Minor. When I drove through the area last week, all of this was gone. Instead I found numerous, enormous irrigation installations up to 500m long, the trees all gone, and the gentle, lush paddocks turned into garish muddy fields, trampled by tens of thousands of cows standing around this previously beautiful area. Kilometer after kilometer the same picture: cows, cows, cows, trampled brownish paddock, dirty stream, macmansion, milking shed, cows, cows, cows, and so on. The place looks like a landscape from Mars (or Moon, or just insert your favorite planet/moon here). The toll dairying has taken on this once picturesque part of New Zealand is unbelievable, and the Waitaki District Council and the individual farmers have to ask themselves how much damage in the name of profit maximisation can be done to the environment. It’s not like this area was pristine prior to the arrival of dairying. Sheepfarming and crops all changed the look of the landscape since the arrival of the European settlers, but this pales in comparison with the damage that has been done over the last few years. As a tourist destination, Waitaki has lost its natural attractions. There are only so many people wanting to see streams full of cow affluent and dug up paddocks devoid of trees, hedges and birds. We are witnessing the self destruction of a whole district with its local government contributing to the damage. You are right about lots of trees going, though only on farms which have centre pivots. There are still lots of treees on other farms and irrigation will help with more plantings becuase it counters recurring droughts which made it so difficult to establish plantations, shelter belts and amenity plantings in the past. But if you were in North Otago recently the muddy paddocks were a result of rain not irrigation. We got about 250 mls (12 inches) which is around half our annual rainfall in a few days in May and have had several heavy rains since then. Cows are deliberately kept in a few paddocks when it’s that wet to minimise damage to pasture and soil. It doesn’t look pretty but it’s the best way to cope with too much rain over winter. “Waitaki has lost its natural attractions.” the little blue penguins, the fossil trail including Elephant Rocks, the Moeraki Boulders . . . There are lots of natural attractions in Waitaki and the Alps to Ocean cycle trail will take people past many of them. Irrigation still covers only a small part of the district and the regional councils are very strict on effluent discharges. while I am sure you’re right with all of your comments, the visual impact is nevertheless striking, and the difference that 2 years have made is quite astounding. I noticed the ‘Listener’ feature on dairying in NZ as well, and obviously not all is right.